Each of us once possessed great creative power. Yet somehow,somewhere, creativity has been lost, and with it the joy and growth thatit brings. When we don’t feel creative, we don’t feel fulfilled. Discoveryour creativity story: why you had it, how you lost it, and how to getit back. 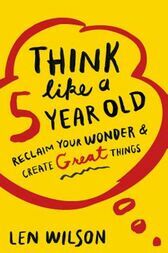 As you journey to reclaim your wonder, you’ll learn how to useit to create great things in your personal and professional life. Only then can you discover a more fulfilling life.